The goal of the homeowners in this Aubrey, TX project was to take this diving pool and create a more user friendly “play pool”. After removing the decks, coping and tile the pool shallowed up with new tile and a more modern pebble finish installed to give the homeowner a more natural feel. The deck is paver brick which will allow for easier releveling in the future. We also added a seating wall for entertaining near one end. We outlined the pool with Leuders stone for a more natural limestone look. This pool was originally built by Gene Gohlke in 1963. 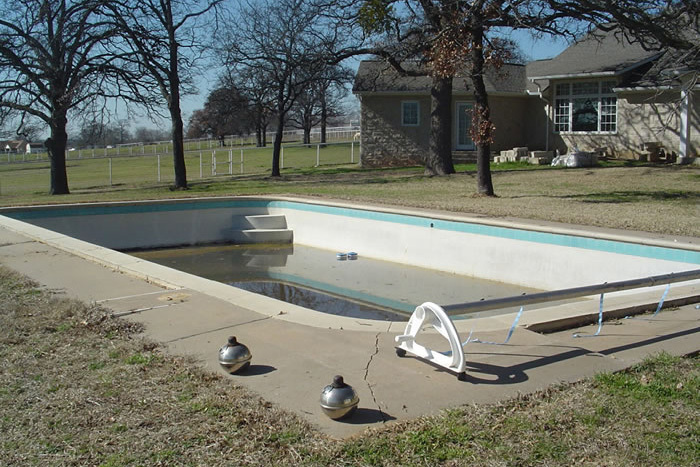 The Denton, TX owners wanted to update the feel of their pool and add a spa for those chilly nights. After excavating the spa and adding dual drains for safety, we added Leuders stone for the coping and raised wall. Along the raised wall we added sheer descents for beauty and the ambiance of a waterfall. The interior finish is PebbleSheen for a more lagoon feel. The decks were acid stained to finish out the look. This vinyl lined pool was in desperate need of updating. Gohlke Pools removed the vinyl liner, decks and steel walls, formed the pool and shot gunite to make this pool a more “permanent” pool. On one side of the pool we added a large waterfall. We updated all equipment and acid stained the newly installed decks. The interior finish is a dark pebble any the owners selected a natural tile to accent the waterfall. They also decided to install a Jacuzzi spa off to one side for privacy. Gohlke Pools originally built this pool in the late 90’s in Denton. The homeowner wanted to update and give the backyard a more entertaining feel. We removed the coping and tile install a pebble finish, constructed a wall along the back of the pool with a sheer descent water feature. We replaced the coping with travertine replaced the decks with washed aggregate, constructed a roof structure with built in grill area, for entertaining and built a fire pit for those chili evenings.